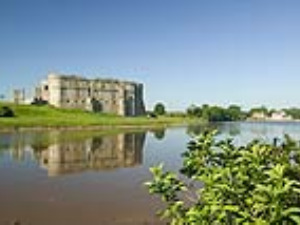 Carew Castle & Tidal Mill CastleCarew Castle and Tidal Mill’s rich history spans over 2,000 years and tells of knights of the realm, kingmakers, Elizabethan intrigue and Civil War devastation. To 15 February: Castle only 10am-3pm Monday to Friday. 16 February - 3 March: Castle 10am - 4pm daily & Tea rooms 11am - 3pm daily. 4 - 22 March: Castle only 10am-3pm Monday to Friday. 23 March - 5 April: Castle only 10am - 3pm Daily. 6 April - 26 October Castle and Tidal Mill open every day 10am-5pm. 2018/19 Winter prices to 31 March (Castle only): Adult £4.50, Child (4 - 16) £3.00, Seniors & Students £3.50, Family (2 + 2) £12.50. 2019 Summer prices: Adult £6.00, Child (4 - 16) £4.00, Seniors & Students £5.00, Family (2 + 2) £16.00. Thu 18 - Tue 23 Apr Have-a-go-Archery! Sun 21 - Tue 23 Apr Have-a-Go: Coracles! Road: On A4075, sign posted off A477, 5 miles East of Pembroke. Bus/Train: The nearest train stations are at Pembroke Dock and Tenby, where you can catch the 361 bus service to Carew. There is free entry to visitors arriving by public transport or bicycle (upon request).